Last night, while I was laying in the bed of my grandparent’s motorhome (Yes I willingly chose to sleep in their motorhome, which is like another bedroom anyway, that is parked next to their house while I’m vacationing here. I like it because I have my space and privacy, so no complaints. 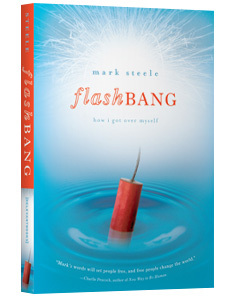 ), well after midnight, I finished one of Relevant’s newest books, Flashbang, by Mark Steele. Overall, I enjoyed the book. It is of the genre of the “in” books within Christendom at the moment – the Faith Memoir. Well, I was away for the year and a half a phenomena hit that I’m still learning about – that being Blue Like Jazz. Which is indeed a faith memoir, at first I thought it would be pretty cool so I promptly ordered it, but in the midst of work and “work books” that I needed to read it got pushed further and further back. By the time I got a chance to read it had become the “in” thing and when something becomes the “in” thing within Christendom I become a little bit of a skeptic. I’ve never been one to follow the crowd for better or for worse. Well, I think in the next week or so I’ll actually start Blue Like Jazz because if I don’t, I think some will truly question if I’m a Christian. What’s up with that anyway? Why do we latch on to the next greatest thing and so on? I mean give me a break folks, some of these books are good, but man you’d think that people would begin to petition and ask for the Purpose Driven Life or the next great thing (from what I hear Rob Bell’s Velvet Elvis could be the next one) to be added to the Bible. Well, I could get going on my soap box with this but I wanted to share some of the nuggets of wisdom I learned from Flashbang. I think what struck me most from the book was Steele’s honesty and authenticity, these are two things I place high value on and this book spews of both. Whether it being defecating in his pants before foreign dignitaries or his myriad of injuries. (it is an hilarious book) I could relate with him, and on top of that he began speaking in language I like! He does this with describing what a flashbang actually is, that being “a weapon used by our nation’s police forces and military that is, in fact, not a weapon. It is a grenade, if you will. One that sounds off a resounding concussion – but the device in question also has a bonus, more perplexing feature: it emanates a stunning bright light that is not actual fire. In other words, our military utilizes a gadget that looks and sounds like devastation without actually causing any. An explosion but not an explosion. A distraction with no destruction. A big noise and a lot of flash that leaves no lasting mark.” Man, that was a longer quote than I expected, but I think you catch where he was going with this. As I read this, I began to think of many ways and times where I have been a flashbang. In my short walk with Jesus (nearly 6 years) I have, sorry to say, been a flashbang all too often. Emanating a bright flash and perhaps even making a big BOOM, but leaving no impression, leaving no crater. Are you the real thing or just a flashbang? I know what I desire and it isn’t that I would just be a bright flash! Steele put it like this, “You see, I have a passion… To shake things up. To incite change.” Well Mr. Steele you and I are on the same page, you are speaking my language. This is what nearly every journal entry is about, this is what I call the REVOLUTION. Not merely being happy with the status quo, but yearning to see a radical shift that turns people’s world upside down. This is what I so badly desire to see in our world. I’m tired of being a flashbang and seeing my brothers and sisters that walk with Jesus being flashbangs. What would it look like if we all left indentations in this world? How would are world look different? I could continue to give you a nice, neat little book report, but you should check it out for yourself. In the mean time I pray that you will daily see ways to fuel the Jesus Revolution throughout your world and the world at large! Check back in the next couple days for my insights of returning to the States after a year a half….